The weekend is just around the corner and I often look forward to entertaining friends and family. If throwing an extravagant dinner party doesn’t interest you much but playing the “Haute Hostess” is, I guarantee you’ll love this simple entertaining inspiration that requires little work from you but offers huge impact for your guests. 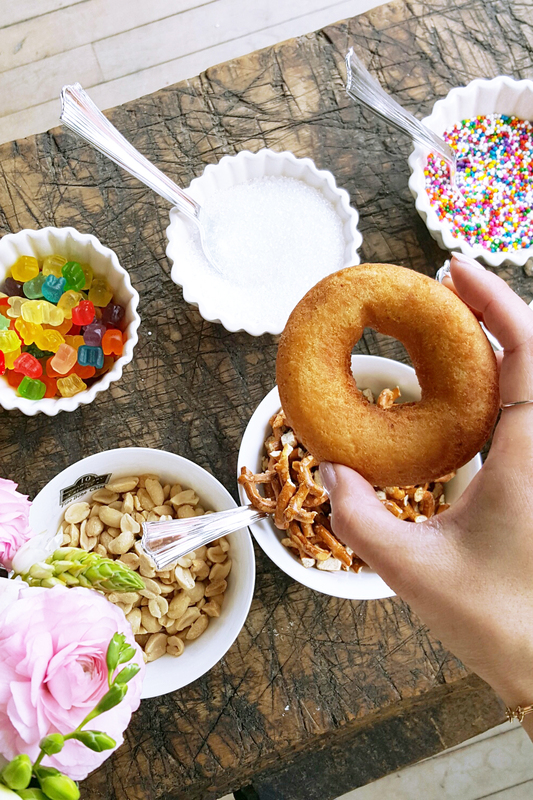 Get ready to round up the #squad for brunch at your place because I teamed up with Mode to reveal my secrets for creating a fun (and seriously delicious) DIY buffet station where guests can decorate doughnuts and make mimosas just the way they like them! Watch my latest video to see how to prepare your own DIY Doughnut and Mimosa Bar just in time for the weekend or Mother’s Day! What do you have planned this weekend? Whatever you’ve got in store, I hope you’ll take a brief moment to indulge at home with your favourite people and treat them to your own doughnut creation! Be sure to check out my last video tutorial on creating beautiful mini flower arrangements!